This summer might be a great time to explore new tech tools. So over the next couple of months, I’d like to share some handy resources with you. This week I came across Katrina Schwartz’s article at Mind/Shift, “Apps That Rise to the Top: Tested and Approved By Teachers.” She summarized an extensive list of apps put together by Michelle Luhtala. Luhtala is a librarian from New Canaan High School in Connecticut. 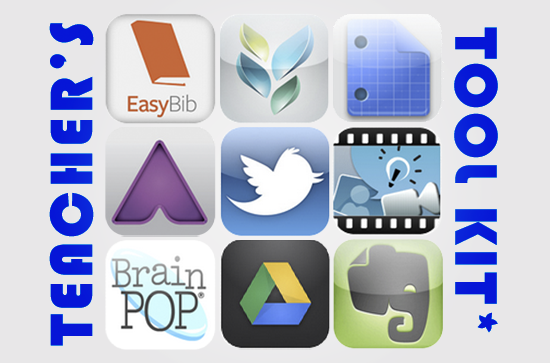 She compiled this list of apps voted on and reviewed by educators. She explains, “I wanted to make sure we had some flexibility because there’s no one app that’s better than all the others.” Thank you, Michelle Luhtala! Schwartz’s article provides a handy breakdown by category, which includes presentation tools, video tools, photo editing, augmented reality, reading engagement, english language arts, commenting tools, coding, organization, digital citizenship, bibliography, social media, apps for educators/librarians, and miscellaneous. She also summarizes each one within the article so it’s a nice simplified reference. Luhtala’s list gets more in-depth, which might take more time to read, but will help you compare and decide which apps to try. The list also includes reviews and indicates how many users on the site have added the app to their “collections” and how many people have used the apps. Aurasma is an augmented reality app that’s changing the way millions of people see and interact with the world. Bring tagged images, objects and even physical locations to life with interactive digital content, such as video, animations and 3D scenes, we call Auras. Evernote is a great tool for teachers and students to capture notes, save research, collaborate on projects, snap photos of whiteboards, record audio and more. Explain Everything is an easy-to-use design tool that lets you annotate, animate, and narrate explanations and presentations. You can create dynamic interactive lessons, activities, assessments, and tutorials using Explain Everything’s flexible and integrated design. Haiku Deck is the simple and fun new way to create stunning presentations – whether you’re pitching an idea, teaching a lesson, telling a story, or igniting a movement. Pricing: Free | Average Rating: 5 stars! iMovie ’11 helps you turn ordinary home videos into captivating Hollywood-style trailers that are fun to watch and share. Google Drive lets you store and access your files anywhere — on the web, on your hard drive, or on the go. Google Docs is an easy-to-use online word processor, spreadsheet and presentation editor that enables you and your students to create, store and share instantly and securely, and collaborate online in real time. Pricing: Both are free. In fact, Google Docs is accessed through Google Drive. Average Rating: Google Docs only received about 3 stars, but Drive received 4.